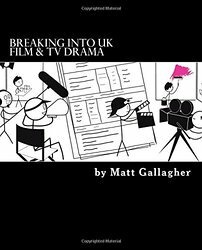 Breaking Into UK Film and TV Drama, written by industry insider Matt Gallagher is a comprehensive guide for new entrants to the UK’s creative industries, offering in-depth advice and practical tips on how to break into the business and build a sustainable career. It's available from Amazon for £13.29. Matt Gallagher is the founder of The Call Sheet and author of Breaking into UK Film and TV Drama. Matt has spent 15 years working in the film, TV and commercials industry in the UK. The Callsheet is a database of UK crew and jobs. The book also includes unique contributions and advice from leading organisations such as AMPAS, BAFTA, Creative Skillset, Film London and WFTV, as well from Oscar and BAFTA-winning talent including Amma Asante (director, A United Kingdom), Steven Hall (VFX DoP, Star Wars: The Force Awakens) and Rebecca O’Brien (Producer, I, Daniel Blake). A comprehensive guide to finding work in UK Film and TV Drama for new entrants and graduates.